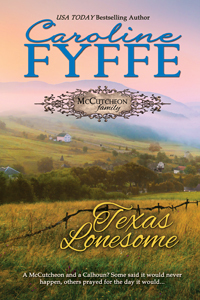 Dustin McCutcheon gets the surprise of his life when he comes face-to-face with Sidney Calhoun, the spitfire offspring of his father’s worst adversary. The whole of Texas knows that McCutcheons and Calhouns just don’t mix. Period. Yet Dustin is drawn to Sidney. The stirrings of attraction she brings out leave him with a serious decision to make. Break the hearts of his family—or break his own. Neither choice is palatable . 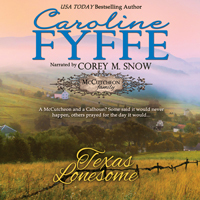 . .
Texas Lonesome, book eight of the McCutcheon Family Saga, continues the story of the brave and passionate men and women of Y Knot, Montana, and Rio Wells, Texas, by USA TODAY Best-selling Author Caroline Fyffe. Dustin McCutcheon shifted his weight from one hip to the other, feeling his denim trousers pull snug around his thigh. He gazed at the three choices in the palm of his hand. Which flavor would the cowhands prefer? He lifted the rectangular Fry’s Chocolate Cream bar to his nose and took a deep whiff. The store clerk loudly cleared her throat. At that, he caught sight of a young woman standing in line behind a man holding a can of lamp oil. She waited for her turn with a small boxy item in her hands, a V pulled down between her delicate brows. 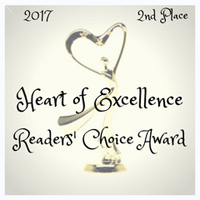 Dustin’s heart thwacked against his rib cage, causing a small cough to escape through his lips. Embarrassed, he thumped his chest with a fist and felt a silly grin pull at the corners of his mouth. “Excuse me,” he quickly said, daring another fast glance at the young woman. The portly clerk pierced him with her cranky gaze. The woman’s disdain-filled voice was meant to slice him to the quick, but it only made his smile grow. She probably thought he meant to stick a few bars into his shirt pocket when her back was turned. 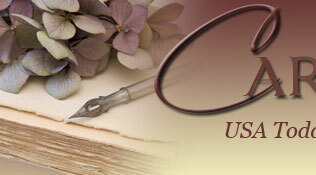 Again, he glanced past the clerk to the young woman, who was now looking in his direction. He smiled and lifted one shoulder. A stain of rose started on her neck and then colored both her creamy peach cheeks. She quickly looked away. Her toe tapped on the scarred wooden floor. His sisters, Madeline and Becky, were always chattering on about men and suitors and the like. How embarrassed they got when they couldn’t control a blush from coming on under an attractive man’s attention. Or how they caught themselves wringing their hands, tapping their toes, or God forbid, giggling. The clerk finished with the man and he headed out the door. Still looking at the candy in his palm, Dustin watched surreptitiously from the corner of his eye as the young woman stepped forward and placed her item on the counter. No sign of a wedding ring. “No, just this music box, please,” she answered. Dustin tried to pull his attention back to the chore at hand, but he had little luck. The young woman looked pleased with her purchase. He wondered if she was buying it for herself or for someone else. He liked that idea—might be nice to have a sweetheart who thought him special enough to buy him a gift. He had his family, of course, but that wasn’t the same. She withdrew several coins from her reticule and placed them in the shopkeeper’s hand. When the transaction was finished and the matron had wrapped the item in paper, he was ready when the young woman turned and stepped toward the door. “Yes, the cowhands that work on my ranch.” Well, the Rim Rock was his ranch, as well as Pa’s and Chaim’s—and his ma and sisters. Heck, he couldn’t say all that. She came a little closer, perusing the candy in his hand. “I prefer plain chocolate. I’m sure you won’t go wrong with that.” She smiled up into his face. Her voice was that of a songbird’s. Dustin thought the angels had descended from heaven. Reaching up, her hand quivered slightly as she angled the watch pinned to her bodice to check the time. At the sound of the door closing, he turned around to see the back of the woman’s dress as she hurried away. He wanted to run after her, get her name, but he had an appointment in a few minutes that he couldn’t miss. A friend’s life depended on it. He had just enough time to finish this purchase and take the confections back to the hotel. With a couple of days left in town, he’d find her. She didn’t look like a local—too soft and clean. Yes, he’d find out who she was before he left if it was the last thing he did, or his name wasn’t Dustin McCutcheon.